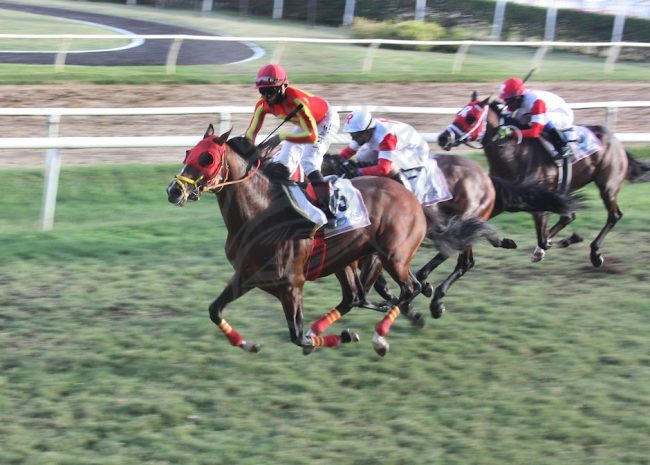 Dorsett, a horse Marette bought for owner Terry Hamilton as a yearling, won his second Barbados Gold Cup over the weekend for his new connections. “Ken Ramsey can be forgiven if he has someone make him a voodoo doll of a horse named Dorsett (Artie Schiller), for the 7-year-old former claimer is the only thing that has stood between him and four straight wins in the Sandy Lane Barbados Gold Cup Saturday. The 2017 Cup looked a lot like the 2016 renewal. Ramsey, who makes no secret of his passion for the $107,000 event that is much a horse race as a national celebration, thought he could win his third straight last year with Watchyourownbobber (Hard Spun). Instead, he had to settle for second as his horse was no match for Dorsett. A year later, Ramsey brought Keystoneforvictory (Shakespeare) and High Noon Rider (Distorted Humor) to the Carribean nation only to see his red and white colors fall short once again as Dorsett won the Gold Cup for the second straight year. High Noon Rider, the lesser regarded of the two Ramsey horses, was second, while Keystoneforvictory was third. The race was not declared official for some 20 minutes after the race as the stewards reviewed a bumping exchange between Dorsett and High Noon Rider. The odd thing about Dorsett is that he doesn’t do anything particularly well other than win the Barbados Gold Cup. The horse was three for 30 lifetime when claimed out of a Jan. 16 race last year at Gulfstream for $35,000 by trainer Saffie Joseph Jr., a Barbados native. He finished a well-beaten sixth that day. Dorsett was then turned over to local trainer Robert Pierce and ran away with the 2016 Gold Cup, winning by three lengths. He then proceeded to lose his next five races, all of them in Barbados. Despite his 4-for-36 career record and the five-racing losing streak, Dorsett was bet down to 3-1 Saturday, while Keystoneforvictory was the 9-5 favorite. All appeared lost for Dorsett when he walked out of the gate under Jalon Samuel. With the Woodbine-based Rafael Hernandez aboard, High Noon Rider swept to what appeared to a commanding lead on the far turn, but Dorsett wasn’t through. He rushed past the Ramsey horse a few yards from the wire and won by about a half length. The two horses bumped several times near the top of the stretch, but it appeared that High Noon Rider was equally at fault. Ramsey divulged afterward that he wanted to bring Queen’s Plate winner Sir Dudley Digges (Gio Ponti) to this year’s race, but could not because of complications with quarantine. A classier horse than the two he brought, Ramsey might have won the race had he been able to get Sir Dudley Digges to the Carribean. “I really wanted to bring a Queen’s Plate winner because both Barbados and Canada are members of the Commonwealth of Nations,” he said. Ramsey said he will definitely be back next year for the Barbados Gold Cup and hopes to return for years to come. Finding the right horses for the race is not as easy as it may seem. Ramsey owns many horses who would likely dominate the competition here, but running a horse in a $107,000 race that could instead be spotted in a race worth $500,000 or more in the U.S. does not make a lot of economic sense. But having now lost two straight years, Ramsey realizes he may need to bring his A team to the Garrison Savannah Race Course to land his third Gold Cup win. He said he will point Sir Dudley Digges for this race next year.